The popularity of dietary supplementation continues to grow and is the basis of the health-promoting strategies of thousands of healthcare professionals and millions of Americans. Yet clinicians and patients are routinely faced with an onslaught of confusing, contradictory, over-hyped and often misleading information about nutrition, especially dietary supplementation. Unfortunately, many nutrition guideline recommendations and references are decades old and out-of-sync with the latest nutritional research; lacking the practical and clinically-relevant relationship linking the evidence-based science of nutrition with the actual ingredients and products available in today’s supplemental nutrient products. 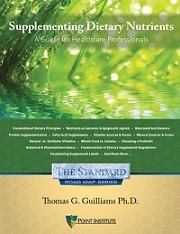 Supplementing Dietary Nutrients-A Guide for Healthcare Professionals aims to bridge this gap. Designed to help answer the real-world questions about supplementing dietary nutrient within the clinical practice, this guide contains both fundamental principles of nutrient use as well as detailed monographs on over 30 micronutrients. All of this, with an insider’s look into the supplement industry; revealing the ingredient sources, manufacturing processes and marketing controversies.